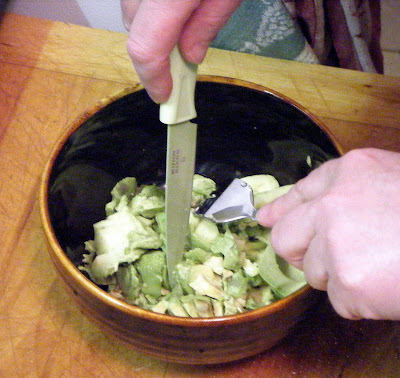 That’s an avocado slicer — something I always thought would be useless, but didn’t know for sure until I tried it — which I did last night. 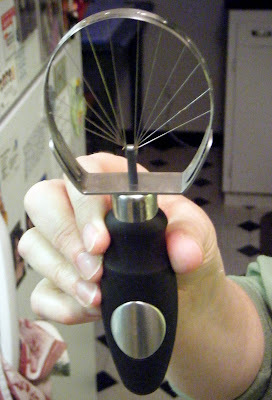 My scooper/slicer is a legacy-utensil that formerly belonged to my dad, Mr. Gadget. Knowing that my darling “wicked stepmother” wasn’t likely to be making guacamole after dad died, I absconded with it (he cooked: her idea of “cooking” is unwrapping a box of Godiva chocolates). That sale — whose proceeds will go to subsidize the fifth grade’s Outdoor Education-camp foray this spring — will be held Saturday, February 7, in the gymnasium at Westgate Elementary School in Edmonds. Hours are 9 a.m. till 5 p.m. and two bucks buys “pre-sale” admission beginning at 8 a.m. At which point one eagle-eyed early-bird might purchase an avocado scoop and a bagel-slicer: cheap! Now tell me: if you were going through your kitchen in search of useless utensils, what would you come up with? P.S. I’m sending out extra-love in advance for your digital photos. Send them via email (nleson@seattletimes.com) for possible publication in a subsequent blog-post.